Photos taken by Tony Kuyper A quote from Flood's Sand to Stone and Back Again, "I shelter deer, pack rats, antelope, and bats. And hikers, like you, or long ago, the Ancient Ones. In my canyons the built their homes, painted pictures, carved messages, and left handprints." Pretend that you are an Ancient One living hundreds and hundreds of years ago in a cave located in the great Southwest with a desire to communicate, to express yourself artistically, or to just have some Simple Saturday fun! Let's take our Styrofoam meat tray, scissors, tempera paint, small art brush, small something to carve with, and piece of paper and roll back the hands of time, shall we? Cut Styrofoam meat tray into 3 X 5 in. pieces. Carve a petroglyph into one of the small pieces. 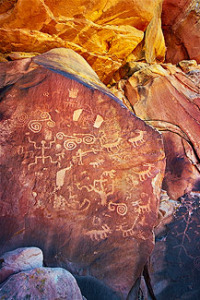 (Petroglyph is another word for cave art.) Brush tempera paint onto the petroglyph stamp. Press stamp onot piece of paper. Great Gods! You've created cave art! Study the cave art in the photos above. What ones speak to you? What do you think the Ancient Ones were trying to say? Be a Anasazi and create your own image, you little Simple Saturday wise one. Tomorrow's Simple Satruday is inspired by Nancy Bo Flood's From Sand to Stone and Back Again. In the book, Nancy speaks of the Ancient Ones, "...People who lived hundreds and hundreds of years ago," who "...painted or carved rock art on cliffs or in caves." Well, in true Simple Saturday form, why don't we make our own cave art prints. Sound like fun? So gather up a styrofoam meat tray, some tempra paint, scissors, something sharp to carve with like a nail or a toothpick, a small art brush, and a piece of paper and let's step back into time and replicate the artistic wonders of the Anasazi...the Ancient Ones.